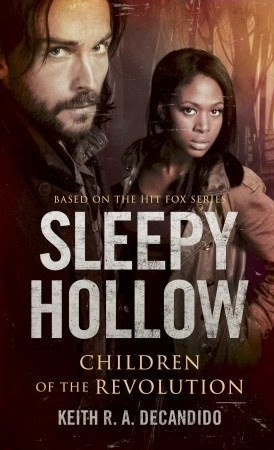 Sleepy Hollow: Children of the Revolution is based on the television series Sleepy Hollow. Abbie, Jennifer, Captain Irving and Ichabod Crane are battling evil once again. Crane has a vision, and in this vision Katrina urges him to find his Congressional Cross. Unfortunately, he died before receiving it, so the hunt begins. But not before the other crosses are stolen and they uncover a sinister plot; Serilda’s coven is once again trying to resurrect their mistress and they need the crosses to do so. Now it’s a race against time to thwart the coven and prevent the resurrection. Will Crane locate his missing cross? Will they be able to stop Serilda once again? This is my favorite television show, so when I was given the opportunity to review this book, I jumped at the chance. This is the first time I’ve ever read a book based upon a series, it’s usually the other way around, so I read with an open mind. I was happily surprised that the book is just as great as the television show. The author puts such vivid details, that you can visualize the entire scenario in your mind’s eye. The parts I found quite comical were when Ichabod Crane tried to understand twenty-first century slang as well as cop lingo. The story takes place between two actual episodes of the series and I thought that was really neat also. This book was seriously difficult to put down; it has everything the television series does and more! I really hated to see it end, I hope there are more of these stories coming!